Super Lube Multi-Purpose Synthetic Lubricant with Syncolon is synthetic, heavy duty lubricant that provides superior wear protection. In penetrates, lubricates and extends the life of machinery & equipment. Super Lube Multi-Purpose Synthetic Lubricant with Syncolon provides excellent oxidation resistance and rust protection. 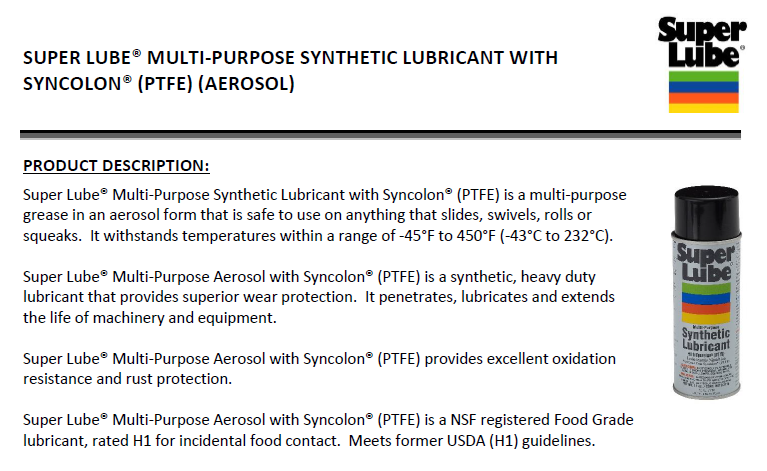 Super Lube Multi-Purpose Synthetic Lubricant with Syncolon is NSF registered Food Grade lubricant, rated H1 for incidental food contact. Meets former USDA (H1) guidelines.